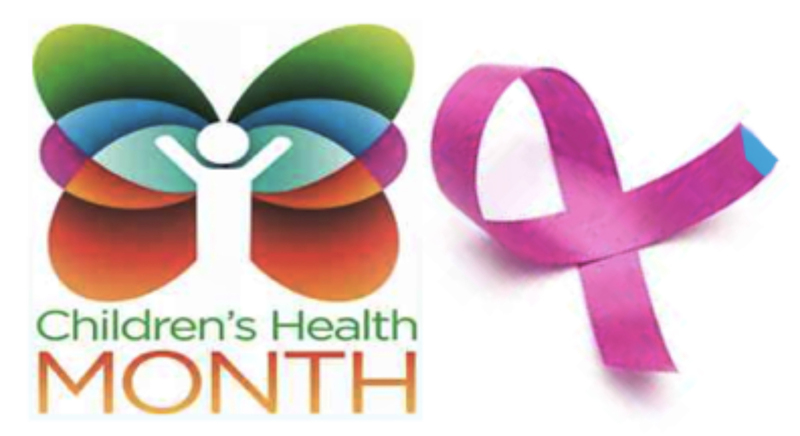 The very important and ubiquitous pink ribbon (with a touch of blue for my fellow male breast cancer survivors/thrivors) triumphs in October, however, it hushes and casts an elegant but huge shadow on the equally important fact that October is, also, Children’s Health Month. Both of the above logos touch my world very personally. In June 1999, I heard the words, “Michael, you have invasive ductal carcinoma. Breast cancer. You need a modified radical mastectomy.” What!? Yes, breast cancer; thirteen years of wonder, amazement, empathy, reflection, and gratitude for each sunrise. Men have breasts…we can/do get breast cancer. Who knew? I didn’t, but I do now. I am also a father, grandfather, and the lead in a major initiative to improve the health and wellness of children. Little babies right through to 19 year-old young men and women. I’m talking about your children, my children, our children. Some of who will, undoubtedly, have breast cancer when they grow up. The wearing of the logo on the right was not my choosing. I am the reluctant and accidental beneficiary of this strangely wrapped gift. I didn’t ask for it; at least, I don’t think so. It’s so confusing. As for the second logo, the health of our children, I humbly and with respect, asked for it and wear it proudly. In the past, I have written extensively on the topic of breast cancer, so this posting is focused on kids. In November 2010, after a very fulfilling and successful — defined as happy, meaningful, and satisfying — 30+year career in the field of health promotion and disease prevention, I retired. Well, okay, I didn’t “retire,” but I pulled myself out of the day-to-day world of what some would call, “work.” I took the following year to write, climb over a mountain pass in the Peruvian Andes, trek to Machu Pichu, walk down the isle with my daughter, celebrate the birth of our first grand child, and give talks to the wellness and cancer communities. Nice, very nice, indeed. And, then, Peter called. Peter Roberts is a friend and colleague that I have known for a number of years. He is a veteran of the health insurance industry, a “C-Suite” hospital administrator, and a long-time proponent of community health promotion and disease prevention. In January 2012, he accepted the position as Executive Vice President, Population Health & Network Development, for Children’s Medical Center of Dallas, one of the top ten leading pediatric centers in the country. On Day One, Peter rolled up his sleeves and — under the direction of CEO Chris Durovich — set out to expand Childrens’ mission beyond outstanding treatment to include the whole child, the total health and wellness of the children of North Texas. Peter asked if I would help. Cue: Ringing of my phone, pinging of my e-mail, stirring of my conscience, shaking of my bones, lifting of my spirit, and yanking on my heartstrings. Would I consider providing some guidance and support to this initiative? Well, yes, yes, of course. Working with children, promoting health, preventing disease, impacting the social determinants of health, helping to form community action groups? Well, yes, yes, of course! I was asked to be — and I humbly accepted — the role of Interim Executive Director, The Health & Wellness Alliance for Children, sponsored by Children’s Medical Center of Dallas. I now live in Dallas three days each week and will do so until we hire a permanent director. My responsibility is to help rally the North Texas community stewards around a transformational initiative to improve the health of all kids living in this area of the country. Mind you, I’m not talking about another politically correct “tweak,” I’m talking about disruptive innovation, ruffling feathers, sacrificing sacred cows; I’m talking stand-on-your-head change. And, this time, going about it by looking through the lens of the community we serve; the kids and their families. I’m talking about their views, their voice, their passion, their lives, and their future … and, by the way, all of that impacts the future of all of us. It’s no secret that despite excellent medical facilities and isolated pockets of exemplary social accomplishment, the health of our kids isn’t good; it’s bad, and it’s getting worse. 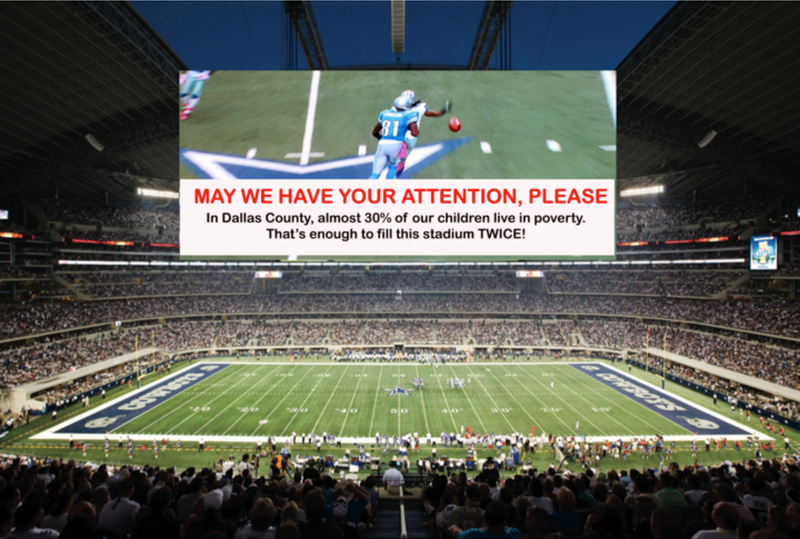 In Dallas County, almost 30% live in poverty…enough children to more than fill Cowboy Stadium TWICE! And, here’s a shocking fact: In this day and age, you could completely fill the stadium with the number of kids in this community who go to bed each night malnourished and hungry. More than a quarter of a million of these kids are on Medicaid, and 18% have no health insurance at all. Also, of growing concern and economic burden is the fact that, in the absence of having a primary care physician, unnecessary emergency room visits are on the rise; Children’s Medical Center of Dallas alone, had over 135,000 ED visits last year; many of those, unnecessary. Your community isn’t much different; just look around. There is a frequently repeated sentiment whispered with a slow headshake, lips pursed, eyes focused downward, and shoulders somewhat slumped in resignation. Yes, that’s the phrase. We’ve all said it—or, thought it—sometimes making a mental note to do something about it. But, for most of us, we simply count our blessings and go on about the business of the day. Follow this blog as I update our progress in North Texas. And, please let me know what’s happening in your community. What steps are being taken to improve the health and wellness of the children; all of the children, yours, mine, ours? So proud to know you and call you friend. I know you will make a difference! Truly a well written and important message. I hope many respond to “the call”. These children are our nation’s future! Michael, such an important thing to do and no one will do it better than you.